What a mismatch. Representing the American League were the Baltimore Orioles, who won 109 games during the regular season. Meanwhile, bearing the National League standard were the New York Mets. True, the Mets did win 100 games, but they were best known for their previous seven seasons of futility, and in the previous year, they had finished ninth. The World Series opened in Baltimore, and Game 1 went according to form with Orioles ace Mike Cuellar topping the Mets, 4-1, with a complete-game six-hitter. Left fielder Don Buford led the hitting attack with a solo homer in the first inning and an RBI double in the fourth. 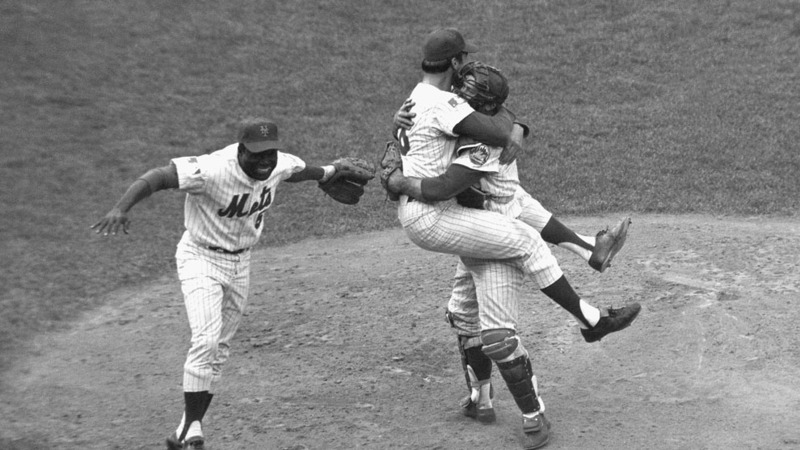 Mets starter Jerry Koosman was brilliant in Game 2, permitting just two hits and one run through eight innings. However, Baltimore's Dave McNally was solid, too, and entering the ninth the clubs were tied at one run apiece. With two outs in the top of the ninth, the Mets produced a run on consecutive singles from Ed Charles, Jerry Grote and Al Weis to take a 2-1 lead. Koosman retired the first two Orioles hitters in the bottom of the ninth, but then walked Frank Robinson and Boog Powell. Mets manager Gil Hodges called on reliever Ron Taylor, who retired Brooks Robinson on a grounder to end the game. In New York for Game 3, Met hurlers Gary Gentry and Nolan Ryan combined on a four-hitter. Tommie Agee and Ed Kranepool both hit solo homers, Gentry himself drove in a pair of runs, and Agee contributed two outstanding defensive plays in center field to rob the Orioles. Game 4 was a rematch of Game 1, Cuellar against Mets ace Tom Seaver. The Mets took a 1-0 lead in the second inning on Donn Clendenon's home run, and that's where it stayed until the ninth, when the Orioles scratched out a single run. It would have been more, but right fielder Ron Swoboda made a spectacular diving catch on Brooks Robinson's drive to right-center. And in the bottom of the 10th, a misplayed ball in left field and pitcher Pete Richert's error on an attempted sacrifice bunt allowed pinch-runner Rod Gaspar to score the game-winning run. The Orioles grabbed a 3-0 lead in the third inning of Game 5, but Koosman shut the door after that. In the bottom of the sixth, Cleon Jones was struck on the foot by a Cuellar pitch -- shoe polish on the ball proved it -- and scored moments later when Clendenon blasted his third homer of the Series. Al Weis homered to tie the game one inning later, and in the eighth, two Met doubles and two Orioles throwing errors gave New York two more runs. The final was New York 5, Baltimore 3, and the National Leaguers had won the World Series.